This is the project I did for last week’s One Month To Win It challenge. It gave me so many problems that I almost included a “rest in peace” wreath when I sent it off to the judges. May I just start off by saying that I normally don’t have a tablecloth hanging from my patio cover, but I could not get my “Outdoor Craft” to show up in photos without creating a blank background of some kind. 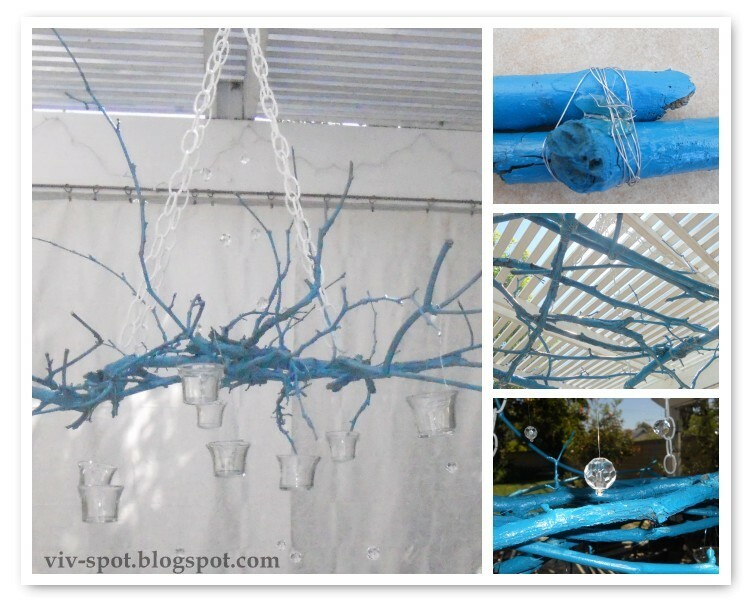 That being said, I made a Blue Twig Chandelier. As the weather gets warmer, it’s nice to be able to hang out on the patio, host brunches, etc. I like to pair the whimsical with the traditional when it comes to setting a table, so here we are.Gathering up sticks and branches, I spray painted them with Rustoleum’s Lagoon blue. When dry, I used 28 gauge wire and hot glue to make a base with the larger branches, then began to layer on the sticks. Once I had a shape that I liked, (and got the darn thing level) I wired on votive cups and used Hubby’s fishing line to hang little beads. And seriously: you do believe me when I say there usually isn’t a tablecloth hanging there, right? Right…? Please head over to One Month To Win It to vote on the final challenge: Repurposing an article of clothing or an accessory. Linking up with parties listed on the bottom of this blog. Click any of their buttons to link up or visit. I loved your chandelier. I can only imagine how much trouble it gave you. I love it. And I think the color is what really makes it. Really beautiful. Off to vote! I love the chandelier! It is so pretty. Great idea on using the tablecloth to get a good picture. The fact that you came up with such a unique idea says a lot and I think it turned out great!! I always start to make something and think it looks like death and wish I never even photographed it– but there’s someone out there who will love it.. and this goes to show… you have more talent than you thought!! Looks like something out of a wedding magazine to me… off to go vote!! 🙂 good luck! So Great! Awesome job, I LOVE the blue that you chose! The blue looks wonderful with the white back drop, sweet idea! Loved it, voted for it. Very pretty. I don’t have any trees near my house where I could hang it from and my patio isn’t covered. This is so beautiful! You really have quite the talent! I think this one of the coolest twig projects I have seen. I LOVE the blue! I can see lots of happy summer parties out there. Enjoy! We love it so much, we just featured it on our Paint Ideas Facebook page as the project of the day. That looks great! I’m thinking of making one for my patio…but I’m afraid the squirrels will think it’s a swing for them to play on. I thought that white sheet was a movie screen. Hey you! I was looking for your e-mail but no cigar.. I was wondering if you wanna blog swap or guest post? Congrats…it’s TERRIFIC your chandalier! So ingenious, just great! Love it…what a job! Wow! That LOOKS like it would do someone in! My hubby just rolls his eyes when I describe all of the ‘ideas’ rolling around in my head because he (like me) is wondering HOW they’ll really turn out! THIS is amazing and no matter how trying it was to create – it is stunning! Ummm…you could sell those! That is awesome! I absolutely love it, and want one for myself. Great job as always! Thanks for linking it up to my Making the World Cuter Monday-you are a rockstar! Oh, this is so cool! Beautiful job. I LOVE it!!! It makes such a great statement! I knew it!! Looks great. Good luck in the final round!! Saw this on one month to win it! Absolutely stunning! I would love to have you link up at my party! This is gorgeous! I love the color! and it has inspired me to think about my own for my outdoor dining area that I am suppose to be doing ( keeping losing my mojo for this project) .. I have atad concern about fire saftey so might use the little faux ( so much nicer than fake) tea lights or candles… still pondering.. Thanks for the inspiration! Wow, this is so creative & fun. The bold blue color really makes it. AND thanks for being honest when a project is difficult–it makes us all feel human when we think of projects that weren’t easy! I think it looks great! Love the shade of blue too. I love the blue chandy!! I think it looks wonderful in your outdoor living space! It will be so pretty at night all lit up! very cool, looks great. thanks for sharing this at my party! That’s a great blue color! Love it. This kind of chandelier is the IN thing right now 🙂 Great job! Really appreciate you sharing this great post with us at the Creative Bloggers’ Party & Hop. I love it! I just finished painting a big branch and putting it in my living room and it also gave me a TON of trouble! Vivienne you are so hilarious! I love that you wanted to put a “rest in peace” sign on it but I think it turned out just fabulous! I seriously cracked up about your son saying it looked like an alien though. 🙂 Thanks so much for linking up another fantastic project to our Inspiration Friday party! We always love having you join in the fun! 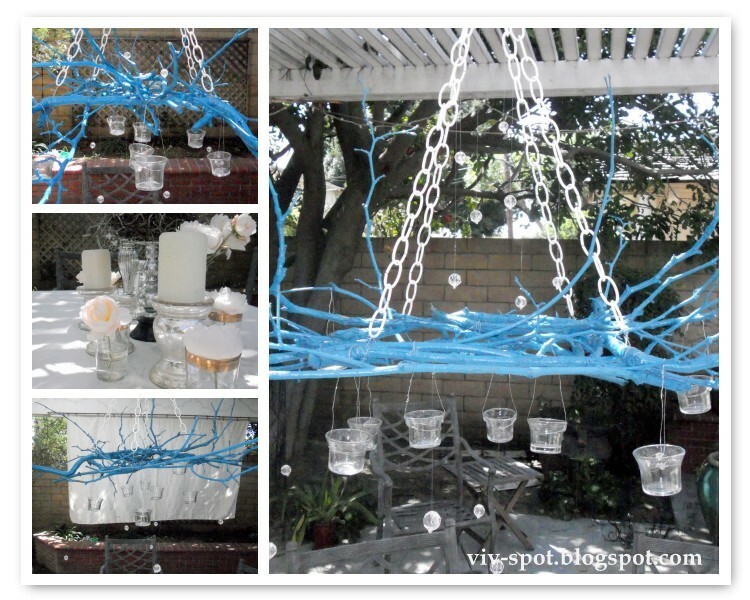 i love how this turned out…the shade of blue is a perfect pop of color against the white decor you have…i was just out walking last night and saw some blown branches and now i can go gather them to make my own chandy…thanks for sharing at fridays unfolded! Wow, this is great! I love the color. Super creative. Wow, I love this! I love the blue and I love the idea. I’m so glad you didn’t give up on the project because it turned out beautifully. You’re more than welcome to link up at the Sunburnt Cow link party. What a fun idea! I love the blue! a blue alien?-that’s what you get for living in a house full of boys! ah ha HAH!! I see why you won! Its FAB-U-LOUS!!! I’m so glad you linked it to the Tuesday To Do party! Can’t wait to see what lovely you post next! That is just so cool! I love the blue and I can’t imagine the work you put into it. Just fabulous! That’s pretty darn amazing! I love the idea of using twigs like that, but the color is GORGEOUS!! I think it would have been really pretty left natural, or painted white, but that blue color REALLY takes it up a few notches, and takes it from pretty to WOW!! I can see why it won – it’s super cute! Congratulations and thanks for sharing. What a lovely idea! Natural, chic and funky! OMG! This looks frickin’ A-MAZING!!! I usually change up our chandy for Christmas, but I have been wanting to change it for summer to something beachy… This may be just the inspiration I needed! Thanks for sharing!! I LOVE IT! I love to incorporate twigs and branches in my decor. Your chandelier is just fabulous, natural and funky! You are so smart. What a great idea. Thanks for sharing it at WUW. Its so pretty. I love the blue. I love this idea! I can just see one in red hung on my porch. . .problem is I can also see my hubs rolling his eyes at me. He’s not quite as adventuresome as I am. . .
Hey girl! The chandelier is taking over blogland!! Love it. Hope you are doing well. What crafts have you been up to this week??? WOW! This is amazing and super easy to make! I’d love if you’d link up to Sew Woodsy! This is so unique and fabulous! Love it! Well, I think it’s gorgeous and you always amaze me, and this is a chandi that I can(try to)make. Thanks Vivienne!